Do I Play Field Hockey? 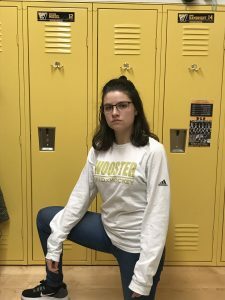 I like to call this look: “I’m an athlete and I want you to know it.” The obvious background of the field hockey locker room perfectly matches my Wooster shirt. The jeans add a semi-professional touch for the tour that I had to give this morning while the nike shoes reinforce my athlete status. The glasses add a bit of intelligence to the look that is desperately needed. I do have to admit, I am mixing brands with the Nike shoes and the Adidas shirt. I apologize to everyone but will probably make the mistake again. How dare you mix brands!? Just kidding, each brand comes with their own strengths and weaknesses. 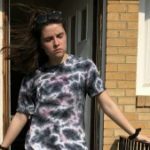 I know that I personally have gone for this look all too often; the long sleeve t shirt and pants. It works well and looks good for many different occasions. I have Adidas shoes that I could wear but I don’t think they would go quite as well with the look (they’re gray and I’m more of a black tennis shoe kind of girl).